Rangoon directed by Rajkumar Periasamy featuring Gautham Karthik is produced by AR Murugadoss and Foxstar Studios. RH Vikram has scored music for four songs in the film. The audio of Rangoon is going to be launched on the 29th May. Earlier in the day, we had reported about the pre-release review of the single Foreign Return which would be unveiled this evening. 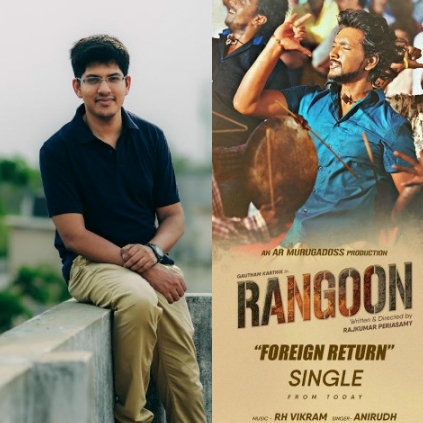 We talked to the young composer Vikram to get more details. “There are totally 6 songs in the album. I have done 4 songs and Vishal Chandrasekar has scored 2 songs. The Foreign Return will be a proper kuthu number for a wedding in North Madras, sung by Anirudh. The 2nd one, a solo, will give you a feel of being in a New York Jazz club, crooned by Maria Kavitha Thomas. The 3rd one is the title track called Yaathreega written by the late Na Muthukumar which is on the concept of Yaadhum Oorae Yaavarum Keleer (the world is your home). This is my favorite track in the album and is sung by composer Naveen Iyer. The 4th one is a lullaby, but it is not a mom singing to her child, but a girl singing to her boyfriend saying everything is going to be alright from tomorrow. Chinmayee has sung this number”. We wish the young composer Vikram success in all his endeavors! People looking for online information on Rangoon, RH Vikram will find this news story useful.